Innovative & masterfully designed Ultrasonic Tips that Supercharge Endodontics. Explore the growing list of minimally invasive procedures with step-by-step guides and masterfully crafted ultrasonic tips for endondontics. Ultrasonics is an incredible tool for dentistry, one that goes far beyond simple scaling. Our state-of-the-art tips deliver outstanding results and we will show you the techniques that allow you to maximize the use of Ultrasonics for Endodontics, Surgery as well as Periodontics. At Helse, we believe in creating great products but also in helping you understand how to use them to their highest potential in your daily practice. 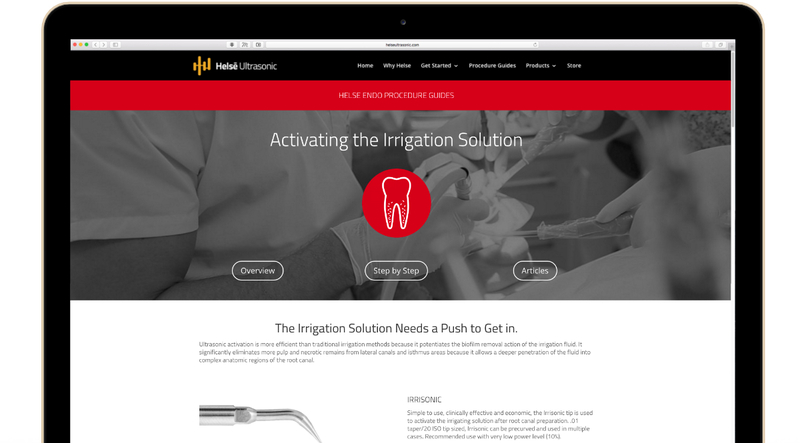 We have created step-by-step procedure guides, illustrations and videos so that you will be able to utilize Ultrasonics in your practice immediately. Designed & Tested by World Renowned Dentists. Helse Ultrasonic tips are conceived, designed and tested by world renowned dentists. The advanced materials and mechanical design of our products facilitate breakthrough approaches to minimally invasive treatments. At Helse, we want you to take full advantage of the power in your hands and are committed to keeping you up to date on the latest practices in ultrasonics. We invite you to fully explore the potential of Ultrasonics through our free Procedure Guides. If you need further information on the basics of Ultrasonics, click on Get Started and we’ll walk you through it.